If you have been reading the blog much, you know by now that Tuesdays I make something for Jeff to bring into the office for Wednesday Treat Day. This way we can get feedback on some of the new things we make from his co-workers. Today is no different.. so let's get goin'! 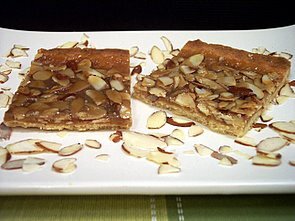 For this treat day, I wanted to go with something a little different so I choose Almond Toffee Bars. 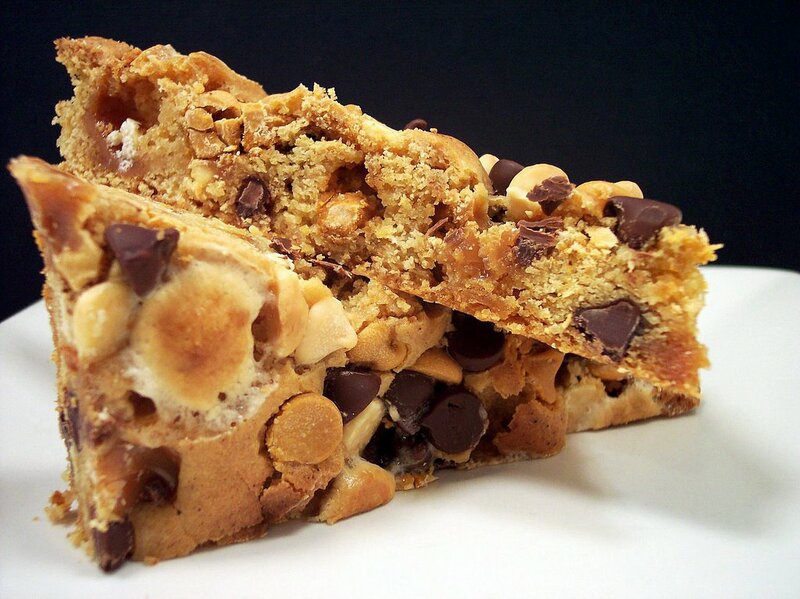 This bar cookie starts off with a crumbly almond flavored shortbread-like base. The cookie base is rich and buttery, but does not leave that greasy residue that sometimes happens. After baked until golden brown, a sweet caramel-like topping is made in a saucepan on the stove. The caramel is spread over the base and a sprinkling of raw almonds adorns the sweet concoction. The next part can be kind of tricky, because you really have to keep your eyes on it. To toast the almonds and set the caramel, the pan is set under the broiler for a very short time. The almonds take on a light color and are slowly surrounded by bubbling sugar. When cool, they can be easily cut into clean bars. 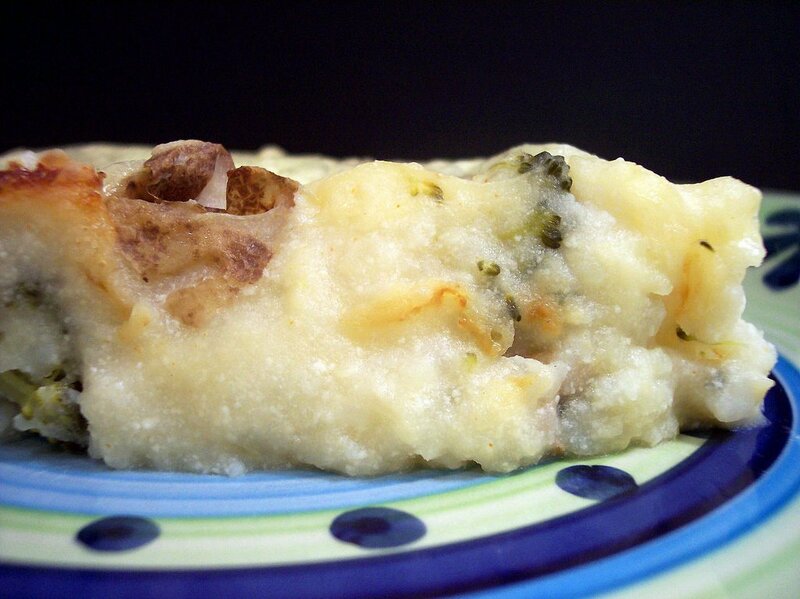 On we go to our veggie dinner - Smashed Potato and Broccoli Casserole. This kind of turned into a giant baked potato like dish. Potatoes are cooked until tender and then very coarsley mashed with some of the cooking liquid. Sour cream and Ricotta are blended in with some fresh dill to liven the potatoes up. 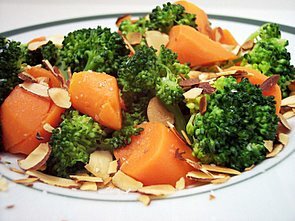 This is a great way to get in some additional veggies; we used broccoli, but you could change this to cauliflower or the like. Gooey melted cheese tops this creamy dish with a bit of sharpness. To add some additional flavor and make it less vegetarian, I would mash the potatoes with warm chicken stock and add some crumbled crisp bacon. As is though, this is tasty comfort food. The recipes I made for dinner tonight are a little out of the norm of what we would usually make. Over the years we have slowly been trying to branch out on different combinations of food and spices. Tonight's combination is why we try these things out, because if we didn't, we would have had no idea we've been missing out on some great food! 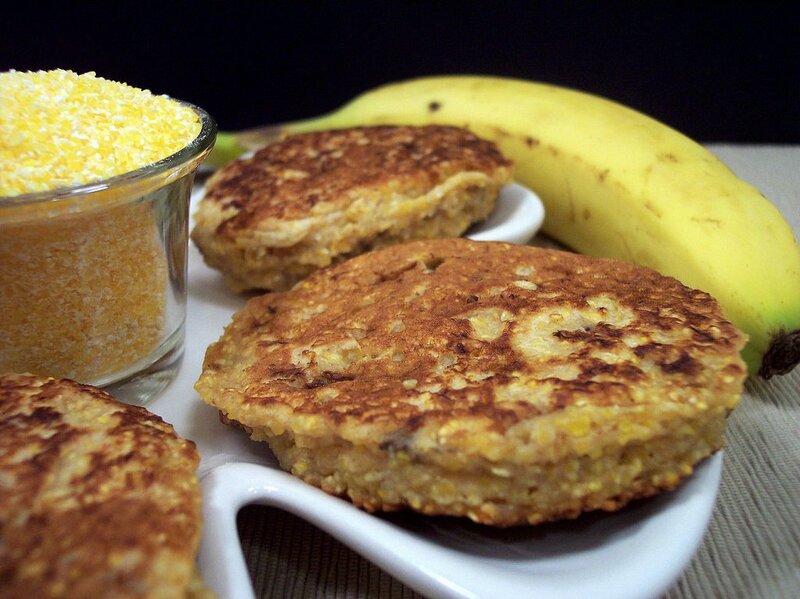 The first recipe, Banana Corn Fritters, brought a whole new level to bananas . The combination of everything sounded kind of odd, but in the end it worked out quite well. These savory little cakes are sweet, spicy, and a little smoky from using ground chipotle chiles. Coaresly mashed bananas are mixed with flour and crunchy cornmeal for a bit of texture. They are quickly pan fried and then tranferred into the oven to bake until puffy. The sweetness from the bananas brings down the heat from the chipotles just enough to balance it out. 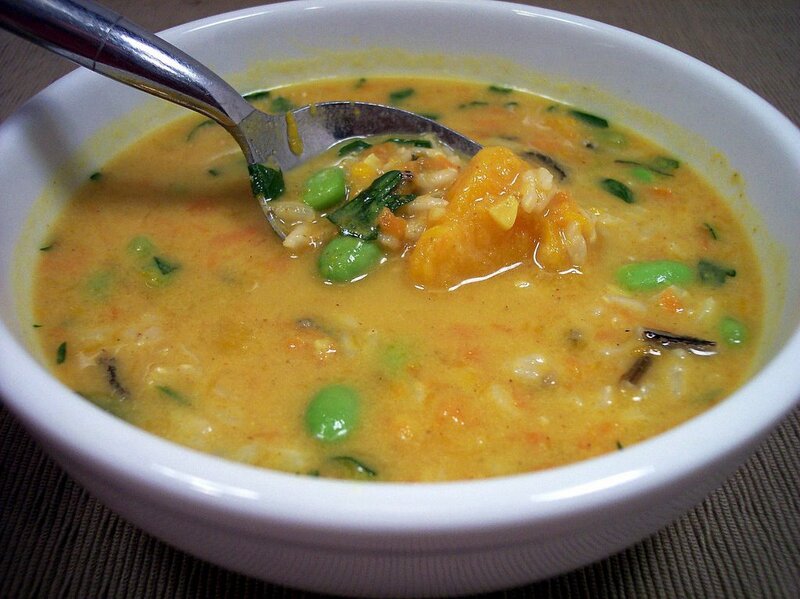 The soup for tonight, Curried Peanut-Squash Soup, is what really drew some attention while I was prepping. I got several looks of "what in the world are you doing" when I was measuring out the peanut butter along side of rice, edamame, carrots and butternut squash. I did use pre-cut butternut from Trader Joes to cut down on prep time. The original recipe called for peas, but I used shelled edamame instead. 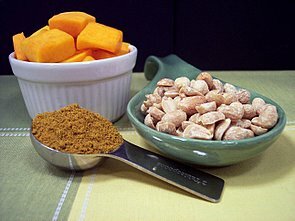 The combination of a hot madras curry powder with sweet carrots and squash was quite an interesting experience. I loved the taste and texture that smooth peanut butter added to the soup. It took a few spoonfuls for us to warm up to it, but in the end we both liked it. The combination of sweet and spicy went over quite well. It was hard to get a semi decent picture as it does not have the best apperance. 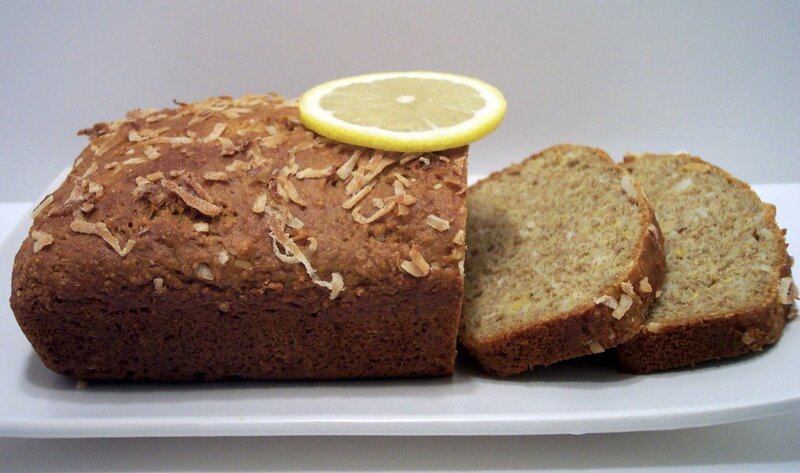 This was our entry for the Virtual Recipe Club - Check for the round up here. It's official, we've hit a new record in Phoenix this past week. To-date, we have not had a drop of rain for 103 straight days... Crazy! I know we are in the desert... but a little something would be nice! 11 new recipes again this past week. I think the ones we liked the most were Curry and Ginger Crackers along with the Pistachio and Carrot Cake Cookies. Tomorrow night we will be having an interesting combination of ingredients for dinner. When I told Jeff what was included (without telling him what it will end up as) I was asked to make sure we had something else we can heat up in case it does not work out... how's that for confidence?! Here's a little peak at some of the ingredients. Netflix also sent us Ocean's Eleven as the other DVD for weekend movie nights. This has an all-star cast, but we've had people tell us it is either a love it or hate it movie. I can't remember if we saw parts of this on TV already, but I'm fairly sure we have not seen the whole movie before. We have a quite an adventurous week ahead food-wise for us. Stop back and see what new recipes we try out next! 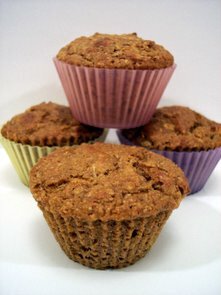 A couple weeks ago I mentioned using some new baking cups when I made a whole grain muffin. I wanted to see how they would do using a lighter batter with a cupcake to see how they would perform. After sifting through the recipe piles I came up with Coffee Cupcakes with Espresso Syrup. If you love coffee I think you will enjoy these. While I do quite like frappaccinos, I am not a huge fan of coffee by itself. So while these definitely have an upfront coffee flavor, it is not overwhelming. If you don't have access to instant espresso, you can use instant coffee, but use just a bit more than the recipe calls for. For something different, before I set these in the oven, I placed a chocolate covered espresso bean in the center of each cup filled with batter. I was worried that it would just sink to the bottom while baking, but it stayed right in its place. After these are baked and allowed to slightly cool, a toothpick is used to poke holes all over the crown of the cupcake. A syrup is then liberally brushed on that is made from a reduction of sugar, water and espresso. It is slowly absorbed into the cupcake and brings a new dimension of flavor and moistness. When cool, a shower of confectioners' sugar is sifted on top. Again, they popped right out of the individual sili-cups with no crumbs left behind and seemed to have an even color. Side by side there does not seem to be much difference, except for the texture from the ripples. I did notice that the ones baking in the separate cups seemed to crack a bit on top, where the ones in the regular baking pan were smooth. Tonight's DVD selection from Netflix will be The Longest Yard with Chris Rock and Adam Sandler. I have not thought much about the menu for next week, but I hope to get it planned out later. It's not like I don't have enough new recipes to look through! Tonight's dinner menu is filled with veggies. 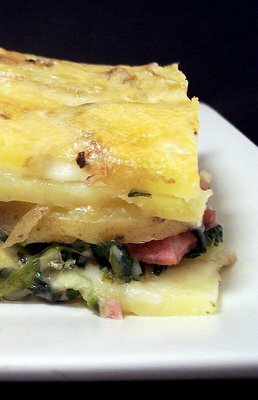 Lots of potatoes, broccoli, carrots and spinach was used to create these two dishes. This first dish could certainly be used as a side dish, but we opted to go with a little larger portions for the main part of the meal. Potato, Ham, and Spinach Gratin is layered with buttery yukon gold potatoes, salty ham and spinach. The potatoes are thinly sliced right before the dish is put together so the starch does not leach out. I used a food processor and that made very quick work of them. I would suggest using that or a mandolin as there are quite a few potatoes and you want to get even slices. The recipe called for an 8X8" pan, which I used, but after baking I wish I would have went with my instincts as a 9" pan would have been better. This one was a little too full for my liking. The rich tender potatoes are covered in luscious Gruyere cheese that melts and seeps into the little crevices between the slices. If you wanted to go full veggie, take out the ham and use another 10 ounces of spinach or another vegetable you like. I had a bunch of broccoli and carrots on hand from a sale that I needed to get used up. Normally I would just steam these and serve them on the side, but I was looking for something just a little different. Broccoli and Carrots with Toasted Almonds was quick to prepare and full of flavor. The vegetables are first quickly blanched to brighten and retain their vibrant colors. They are then pan steamed with a bit of butter and chicken stock until crisp tender. Toasted almonds are sprinkled on top to lend a crunch and an intense nutty flavor. 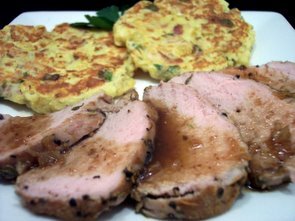 I took these out a little earlier than the recipe calls for as we like them with a bit more snap rather than too tender. Whenever we have soup for dinner, I like to have something crunchy to go along with it. 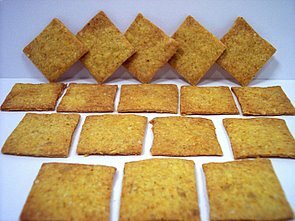 It could be some crusty bread or chips, but since the soup tonight already has tortilla chips as a topping I thought this would be a good time to make some homemade crackers. I wanted something that was thin and crisp with a nice bite to them. Curry and Ginger Crackers turned out to be just what I was looking for. 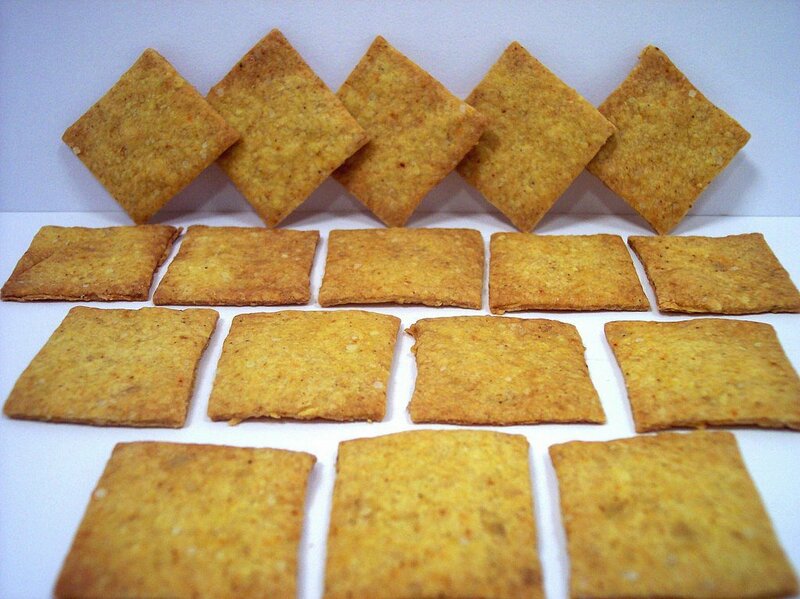 These crunchy crackers are slightly sweet, have a bit of heat to them and a pleasant bite from the crystallized ginger. The ginger needs to be in very small pieces, so to achieve this you would want to have a food processor or even a blender. While you could chop them by hand, it would take forever to get them small enough. Blending them with part of the flour ensures they don't gum up the blades when you process them. The curry in these crackers adds a flavorful and interesting twist to them. Getting the dough quite thin is essential to get the right texture. I have these rolling pin bands that allow me to get an even surface with whatever thickness I need. I used the 1/16" band to get the right size. To make short work of cutting out squares, I used a pizza cutter and a ruler. If your dough sticks a bit when you try to move them to the baking sheet, you can move whatever you rolled it on into the freezer for about 5 minutes. These are quite addictive! The soup I made to go with these crackers for dinner tonight was Chipotle Turkey and Corn Soup. 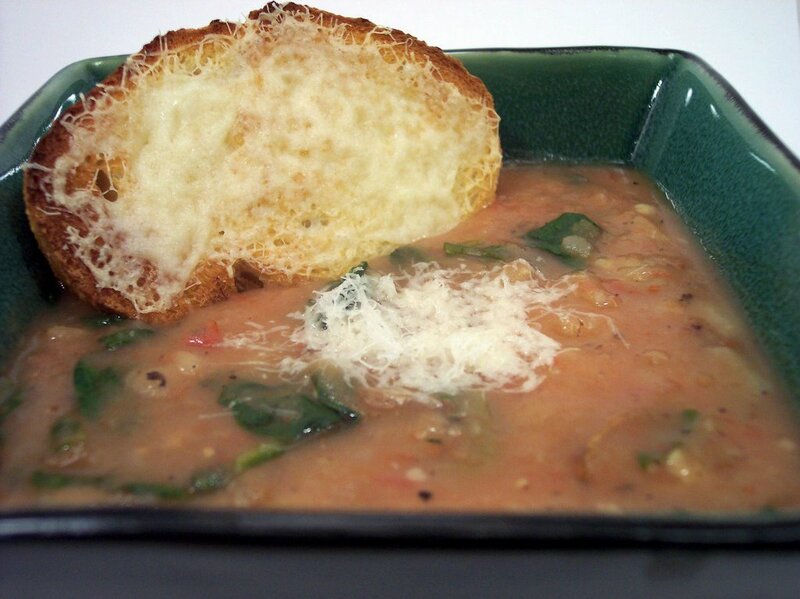 This soup does not need to simmer long so it is great for a quick weeknight meal. Thin strips of turkey breast are seared off until brown and then a quite spicy mixture of chipotles, chicken broth and corn are added. Left to simmer for only 5 minutes, the soup has a high amount of flavor. 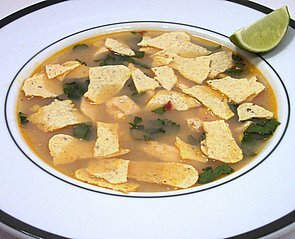 A final squirt of fresh lime juice brightens up the soup and the crushed tortilla chips add a nice texture as they slowly absorb the broth. Warning, this is very spicy if you use the full amount of chipotle and adobo sauce. Reduce both amounts by at least half if you don't like that. Well I'm pleased to report that I think the treats were gone in record time today at Jeff's office. Yesterday I talked about part one, but had to wait until today for the other item because I had to assemble it at the last minute. Fresh Fruit Pizza with Citrus Glaze was the first thing that went this morning. I have made this at least 3 other times for them in the past and this is what they requested for the "last" treat day from the co-workers that were leaving. Sugar cookie dough is pressed in a round pizza pan and then baked off to create a large cookie base. Next, a silky mixture of softened cream cheese, vanilla and sugar is spread on top of the semi-crisp cookie. 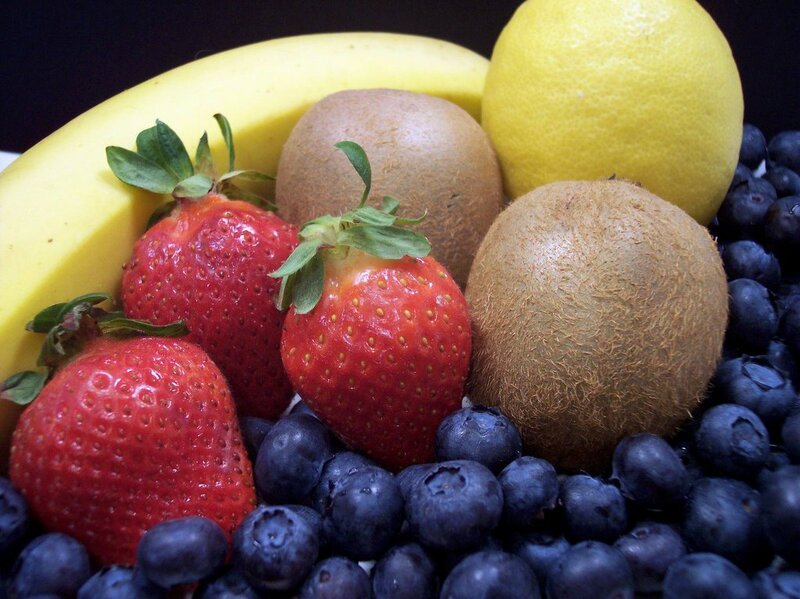 You can use whatever fresh fruit you like, but I decided to go with strawberries, bananas, kiwi fruit and blueberries. I bought a little too many strawberries, so I decided to do a double layer of them on the outside ring. To add an additional layer of flavor, sweetness, and to help the fruit from turning colors, a citrus glaze is quickly made in a small saucepan. Orange and lemon juice are the primary flavors with some sugar for sweetness and cornstarch to thicken. As soon as this mixture thickens, you will want to remove it from the heat so it does not reduce down and get too thick. You want it thin enough to be easily spreadable. 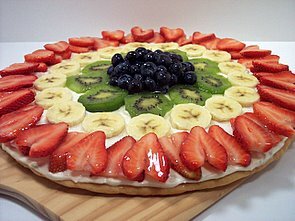 This can be drizzled all over the pizza if desired, but I like to just brush the fruit with it to keep the bright contrast in color between the white cream cheese and brilliant color from the fruit. Dinner tonight was a light pasta salad, Farfalle with Zucchini and Prosciutto. Tender bowtie pasta is coated in a bright dressing flavored with a hint of fresh lemon. Matchstick zucchini is the main vegetable flavor here, but to stretch this dish I think you could easily add some broccoli or maybe some crisp sugar snap peas. Rich salty prosciutto brings a welcome contrast to the mellow pasta. I was tempted to crisp the prosciutto up a bit, but after taking a bite I liked the texture better this way. This is one I will have to remember to make for picnics in the spring and summer time. Light, refreshing and would be a great way to fill up after a hike. I got most of the recipes done today as tomorrow is Wednesday Treat Day for Jeff's coworkers. There will be 2 items and I will talk about the other one tomorrow as I have to wait until the last minute to assemble it. This will be the last one for many of them as they have sadly been let go, so I wanted to make sure I would have enough to go around. The first one, Rocky Ledge Bars, have so much stuff packed into these triangle shaped cookies. It's hard describe them as there is so many flavors going on. 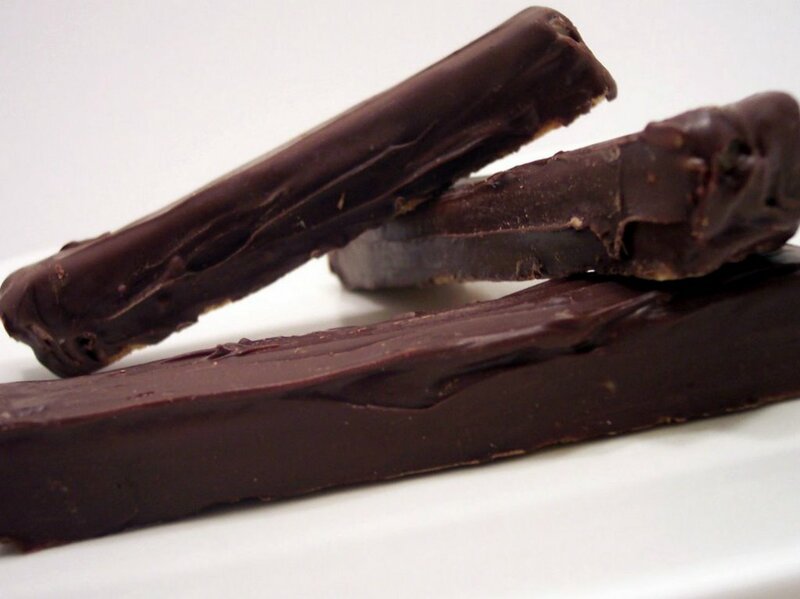 The bars are thick, dense, chewy, and very rich. Each piece is overloaded with white chocolate chips, semisweet chips, butterscotch chips, marshmallows and delicious caramel pieces that melt into chewy puddles. 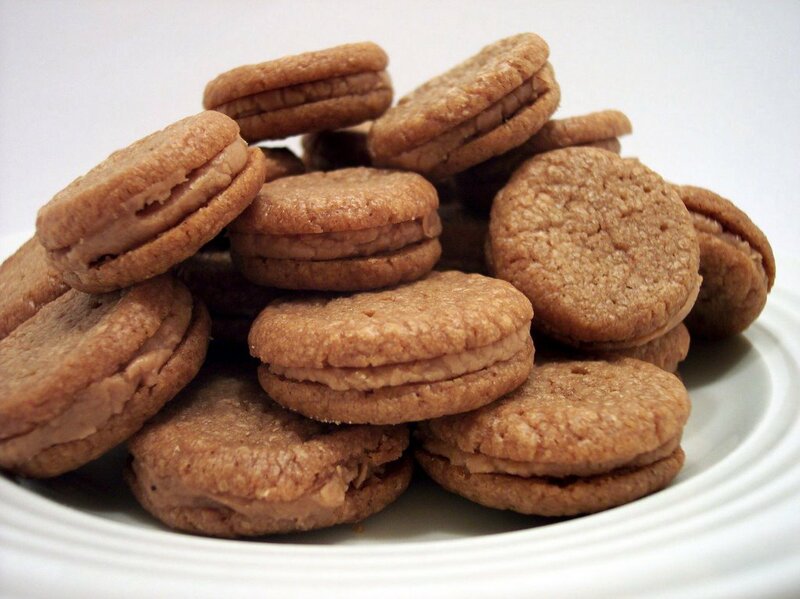 The dough base is buttery with a deep richness from the molasses in the dark brown sugar. It was a little tough to determine the doneness as the dough is already golden and trying to find a clean spot to do a toothpick test was almost impossible without hitting a chip, marshmallow or caramel. Are they over the top? Yes... but wow are they tasty! Tonight's dinner was a nice change of pace in the form of a big ol' apple pancake. Sweet golden delicious apples are satueed in a bit of butter to soften. A heavy egg based batter is whirled in a blender until smooth and then poured on top of the hot apples. After a quick run through a very hot oven the pancake puffs up quite high from the eggs. The batter enveloped the apples when it rose, so I decided to flip it over so you could see the apples on the bottom. Surprisingly, the pancake itself is not overly eggy despite the ratio of ingredients. I left off the maple syrup as they were plently sweet for us and all that was needed was a gentle dusting of confectioners' sugar. We have been doing a lot of cookies lately, so I was trying to figure out what I could make that would be a little different. 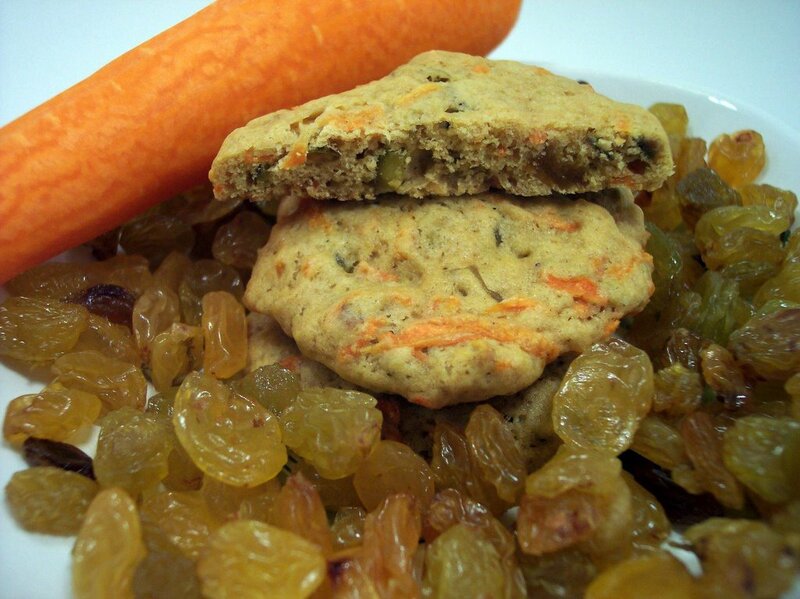 I was fairly certain I wanted to do a drop cookie and had some dried fruit and nuts on hand to use up. 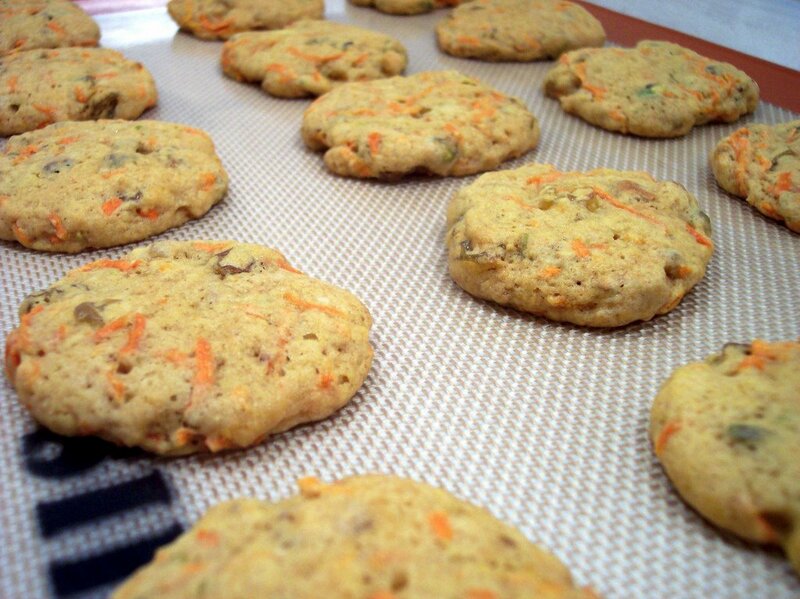 Pistachio and Carrot Cake Cookies are filled with shredded carrots, plump golden raisins, and toasted pistachios. The cookies have a soft and tender texture to them, but they don't fall apart at all. They are slightly chewy, not overly sweet and the pistachios lend a unique flavor and crunch to them. I could see doing a powdered sugar glaze with some orange juice to thin or to make them decadent, you could do a cream cheese frosting/filling and sandwich a couple of them together. However, to me these are just as good plain! Dinner tonight was a very filling salad. Chicken, Red Potato, and Asparagus salad with Toasted Almonds has a light, refreshing and lemony dressing. You could use a rotisserie chicken to cube up, but I just simply grilled off some chicken breasts seasoned with salt and pepper. The red potatoes are cooked until just tender so they are easy to quarter and the asparagus is quickly blanched to intensify the color. 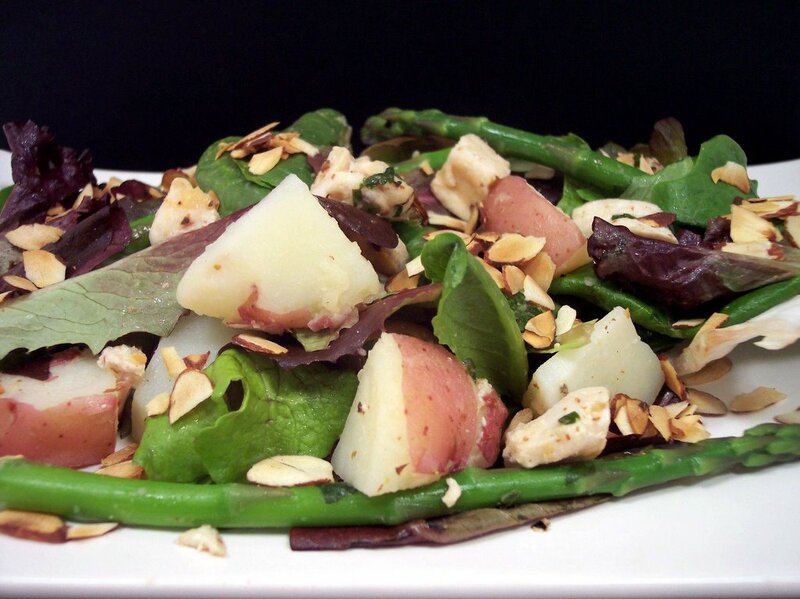 The nutty flavor from the almonds was a great pair to the asparagus. Next time, I might even candy the almonds first to give them a boost in texture and flavor. When I asked Jeff what he thought, I got a "So when can we have this again...?" I agree! Well, we ended up making 11 new recipes again this week. Looking back, the ones that stood out the most for us were "Should be" Gluten Free kinda like a Twix Bars and Potato-Peanut Cakes. I've got the menu ready for this week and it has quite a large selection that I'm really looking forward to. Here's a quick peek at some items that will be involved in the Wednesday Treat Day that we picked up today while grocery shopping. The recipe is not a new recipe to us, but it was a special request from Jeff's coworkers as sadly, many of them will no longer be there after this week. We have not displayed it on the blog before though! The movie last night was pretty funny for having so much graphic violence. I wouldn't recommend eating dinner while watching it. I was not ready for a subtitled movie either, but there was enough going on to keep you interested to figure out what they were saying. Tonight Netflix brings us Millon Dollar Baby with Hilary Swank and Clint Eastwood. We have really been meaning to watch this as it had such great reviews. I can't wait to see it tonight! 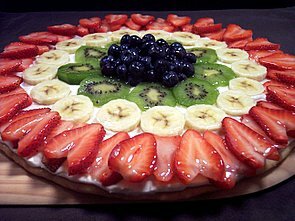 Normally when I would think of a dessert pizza, it would be made with a sweet bread dough or even a regular crust. This recipe may not be your typical dessert pizza, but I can really see making this again for a fun treat. Deep Dish Chocolate-Peanut Butter Marshmallow Pizza starts out with a thick chocolate cookie crust. After pre-baking for a few minutes, it is removed from the oven and raspberry jam is spread over the hot crust. If you don't like jam, or don't happen to have it, you could use so many other things. What comes to my mind first would be peanut butter or a caramel/butterscotch sundae sauce. 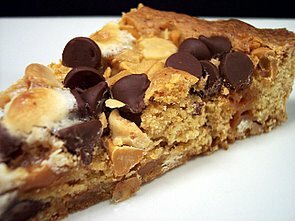 When the crust is spread with whatever you choose, I sprinkled chopped dark chocolate and peanut butter chips over the top. Mini marshmallows are then dropped on top before going back into the oven to finish baking. For something different and fun, use the colored mini marshmallows! 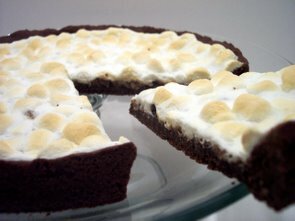 As it bakes, the marshmallows slowly expand and adhear to the crust. They also competely fill up any spaces that were between them. As it cooled, I was trying to figure out how best to cut it since it was covered in gooey marshmallows. I stuck it in the freezer when it cooled down for about 5 minutes and when I cut it, the pieces came out pretty clean and the topping did not really stick to the knife much. While these are excellent cold, if you stick them in the microwave for 10-15 seconds the chips remelt on the bottom and the top gets slightly gooey. While it is fun to watch - be careful as if you heat them too long you will have a big mess from the marshmallows! Netflix brought us the DVD Kung Fu Hustle with Stephen Chow for tonight's movie flick. I have some ideas in mind for the menu this week, but as always I will be going through the packs of untried recipes tonight after the movie to figure out the full week. It was windy and chilly today (well for Phoenix anyway) so I was looking for a warm and comforting soup for dinner tonight. Most soups we make have some sort of meat involved or are pretty thin, but this one tonight was thick, hearty, and totally veggie! 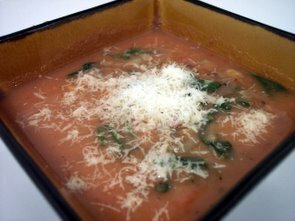 Potato, Spinach and Tomato Soup is naturally thickened from thinly sliced potatoes that slowly break down while cooking. Since we don't mind the skins I left them on, but if that bothers you, certainly peel them before slicing. I was a little worried after the potatoes started melting into the soup as it was quite thick before I added the spinach and tomatoes. I thought about adding some liquid to loosen it up a touch, but after I added them they gave up just enough liquid to thin it enough and keep a creamy consistency. I had some leftover sourdough bread in the freezer, so I toasted up a couple slices and rubbed them with a cut garlic clove. I added some parmesan to them and set them under the broiler to make some cheese toasts to set on top - kinda like a big crouton. The soup warmed us up and was very filling! I did make another batch of the Apple-Cinnamon Granola today. I keep meaning to try some new and different recipes, but keep returning to this as we really enjoy it. Great with yogurt or even ice cream! As I was going through the refrigerator this morning, I noticed that we had some extra cream cheese that I needed to get used up. 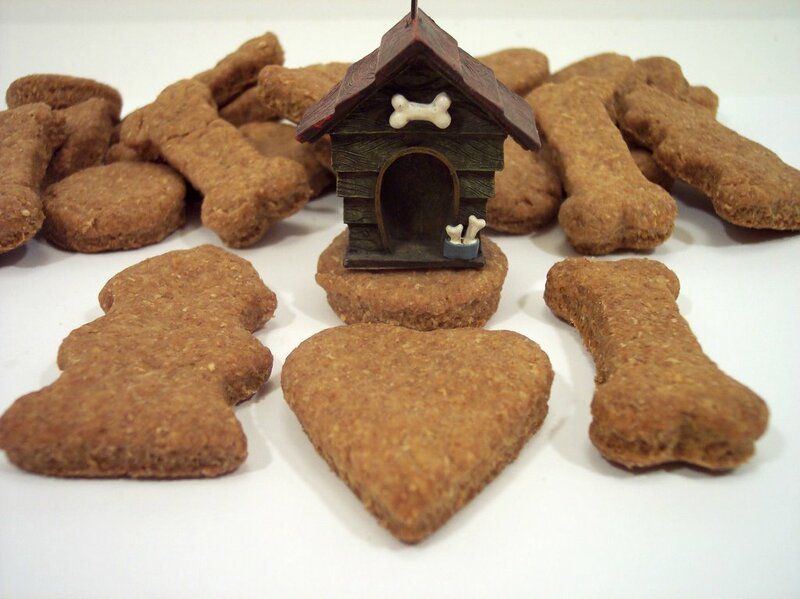 I also noticed we were again very low on the last kind of doggy snacks I made, so I went looking through the piles to find a recipe for them that would use up about 4 ounces of cream cheese. Whole Wheat Cream Cheese Danish Dog Biscuits had the pups going in circles while they were in the oven baking. If you choose to make these, make sure you have no plans to use the oven for awhile after you are done baking them. After just 20 minutes, the oven is turned off and the biscuits are allowed to slowly cool in the oven which allows them to get quite firm and crisp. With only 5 ingredients, it is quick to make and can be easily done with just a wooden spoon and a bowl. The dough is quite soft, yet I found it not to be sticky at all. It was very easy to roll out and held the shape from the cookie cutters nicely. If you find you are having troubles rolling it out, allow it to rest for about 5 minutes and then continue. The doggies are so spoiled! 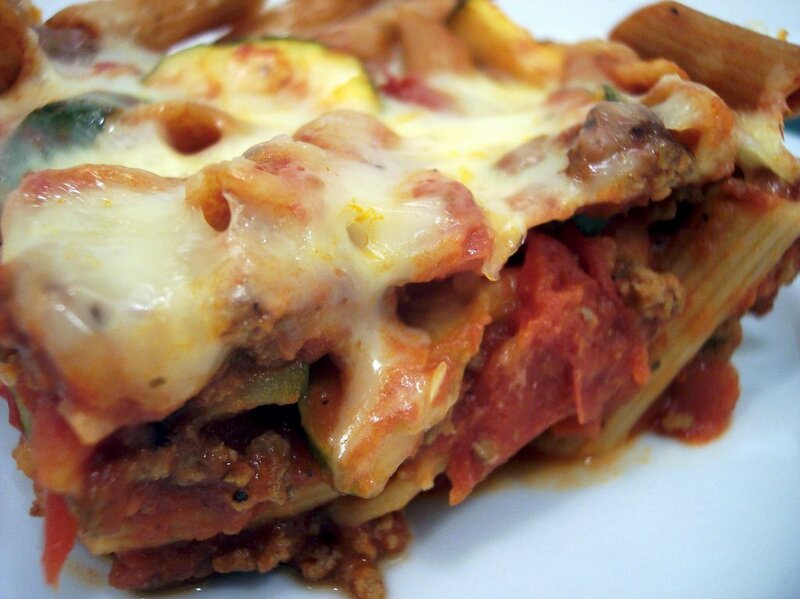 Baked pasta dishes are really becoming a favorite of ours. When I think about how many times growing up I would not touch pasta with a 10 foot pole, I wonder what I missed out on. As I have said before, it has only been the last couple of years since I first tried pasta and why I waited I just don't know. Tonight's dinner, Baked Penne with Fire Roasted Tomatoes, also includes a vegetable I never used to eat either - Zucchini. 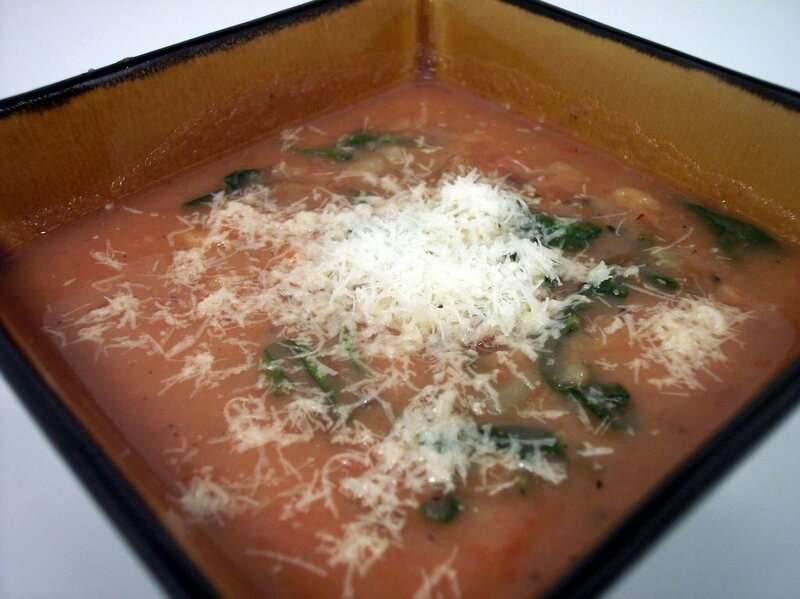 Smokiness from the fire roasted tomatoes adds a depth of flavor that really enhances the sauce. 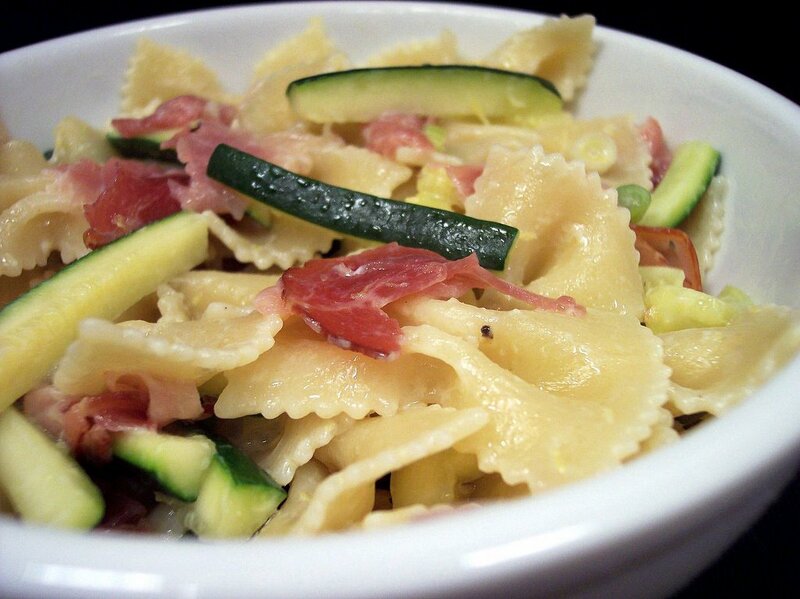 Fresh zucchini slices bring a good texture difference against the tender pasta. After a quick 20 minutes in the oven, a nice helping of mozzarella cheese is sprinkled on and left to melt to finish off the dish. I let this sit for just over 5 minutes and each piece was easy to get out without it falling apart. I mentioned in yesterday's post about another item I was making for Jeffs coworkers to taste test today. I hear they went pretty fast and were given a rating of "totally awesome"... so that has to be good - right? "Should be" Gluten Free kinda like a Twix Bar is a pretty close version of the original Twix candy bar. I say "should be" because from what I understand there is a question whether some chocolate and some vanilla extracts may or may not have gluten hidden in them, but when I checked mine they were fine. If you have no problem with gluten, feel free to use all-purpose flour instead of using rice flour. A golden buttery cookie crust is topped with pale sweet caramel that is simply made from reduced sweetened condensed milk, brown sugar, and butter. If I were to make this again (oh which I will...) I might let this mixture cook a little longer to get a darker color, but the taste was pretty close. After a couple hours in the refrigerator, this caramel adhears to the cookie base and it can be easily and cleanly cut into long finger-like rectangels. 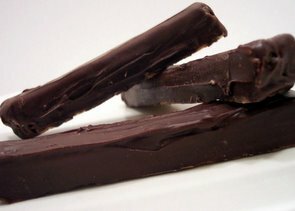 I must confess that I knew I should have used tempered chocolate to coat these candy bars, but I did not have the right kind of chocolate on hand and I didn't have the time anyway. Because of this, and since the bars were still chilly as I coated them, the chocolate began to set a little early on me and they are not as smooth as I would have wanted them to be. I would make sure these are at room temperature before coating them in preferrably tempered chocolate next time. For dinner tonight we had a tasty shrimp dish, Crispy Sesame Shrimp. Jeff really loves shrimp so I knew I had to make this soon when I found the recipe. 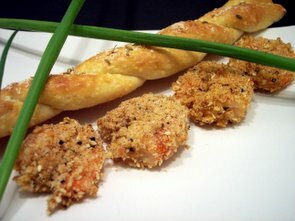 The twist on this recipe is that the shrimp are coated with a crunchy mixture of crushed dry stuffin-mix and some additional spices to liven the dish up. The shrimp are quickly dipped in egg whites and then dredged through the stuffing and spices. To help the bottoms of the shrimp crisp up, I preheated the baking pan in the oven for 5 minutes before I placed the shrimp on. The bottoms ended up being just as crunchy as the top without having to flip them, so I will use this technique again. Yep, it's Tuesday again... so you know it is time to share what I made today for Jeff to bring into his co-workers on Wednesday's Treat Day. This time I went on the mini treat side with some sandwich cookies. 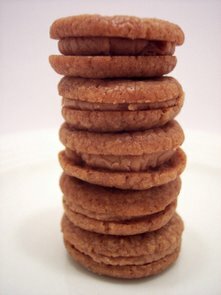 Mini Milk Chocolate Sandwich Cookies was quite a tedious project as it made around 130 or so tiny cookies. The monotonous part of the recipe was trying to cut all of the small cookies out of the dough logs. The rounds looked quite small before they went into the oven, but as they baked they turned a little larger than quarter sized chocolate disks. As they cool, they firm and crisp up, but are still a little fragile as you move them from the baking pan to a wire rack. These delicate rounds are then sandwiched between two cookies and a silky Milk Chocolate Sour Cream frosting. The assembly of them went by pretty fast as they took just about a 1/2 teaspoon of the filling. 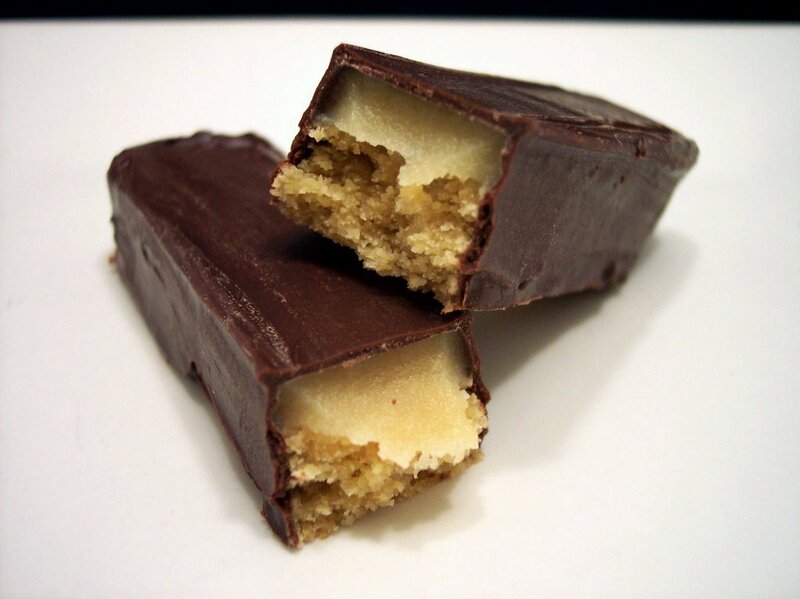 I did test out another recipe that Jeff will be bringing in tomorrow, so make sure you stop by for that tomorrow - It is a "should be" gluten-free clone of a favorite candy bar! Tonight's dinner was a fun way to change up a classic meat and potatoes combo. For the meat portion I made Peppercorn-Crusted Pork Tenderloin with Soy-Caramel Sauce. The tenderlions are coated in a mix of peppercorns, thyme and salt, then quickly seared in a hot skillet until all sides have a caramelized crust. They are then baked for about 20 minutes until just slightly pink and still juicy in the center. Meanwhile, a sweet glaze is made by boiling sugar and water until reduced and adding soy sauce with some zesty mustard. A couple dabs of butter are whisked in to add a richness and to smooth out the sauce. This adds such a nice contrast to the peppercorn studded and fork tender pork. To serve along side I made, Potato-Peanut Cakes. Buttery yukon golds are boiled until tender, then shredded and mixed with corn, onion, and crunchy peanuts. Using a single egg binds this combination of textures quite well to form little cakes. They are cooked on a griddle until they form a golden brown crust. While the outside is crisp, the inside takes on a creamy texture with bits of chunky peanuts scattered throughout. Definitely ranks high on the scale for a new side dish. 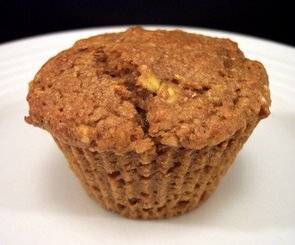 Sometimes in the morning when I'm ready for breakfast I look for something that is easy to prepare and can be eaten on the go. 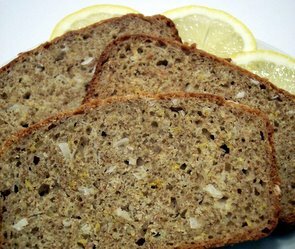 For these reasons, we are a big fan of quickbreads as they freeze well and they only take a couple minutes to toast for a quick breakfast. 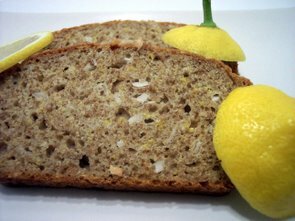 Quickbreads can be whipped up in a matter of minutes since there is no kneading involved and most recipes usually can be turned into muffins if you like. 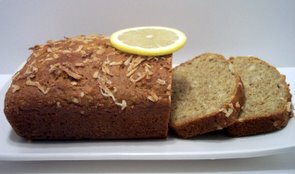 This recipe, Lemon Coconut Bread, had orange yogurt and orange zest as the predominate flavors but I love the fresh taste of lemons and decided to change things up a bit. The recipe called for 8 ounces of yogurt, but since most containers around here are now about 6 ounces, I added some sour cream instead of opening a new one for 2 ounces. The bread was moist, bursting with lemon flavor, and I love how the bright yellow zest stands out when you slice it. 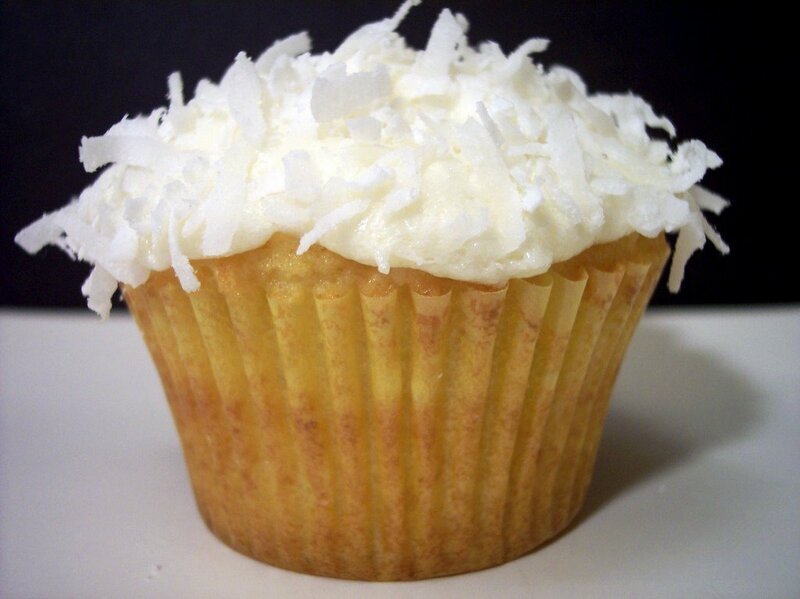 You can taste a subtle coconut flavor and it brings just enough additional texture to make it interesting. Next time I might try adding some frozen blueberries or maybe some dried fruit to bring in another dimension of flavor. For tonight's dinner, I decided to change around a recipe I've been eyeing. 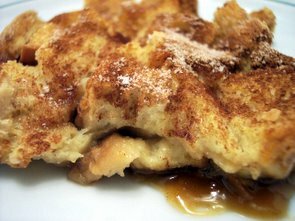 Cubed Caramel French Toast Casserole turned out to be quite the tasty dish. 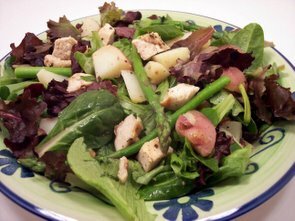 Some reviews of the original recipe said it turned out a little mushy, but with some changes I did not find that at all. Instead of using whole french bread slices, I decided to cube mine (10 of them would not fit in the dish anyway) and I let the bread sit out overnight to stale a bit. Because of the use of High Frutose Corn Syrup in light corn syrup, I tend to stay away, but lately I've been using Brown Rice Syrup for a substitute and it worked quite well here. I also slightly reduced some of the wet mixture to see if that would help the mushy factor. A bottom layer of sweet sticky caramel is topped with crunchy bread cubes which slowly drinks up an eggy vanilla milk mixture over a few hours. After a trip through the oven, the bread firms up and sets well. The gooey caramel sticks well to the bottom bread layer and wiggled its way up through the cubes. We found the bread to be soft, but not at all mushy, just how we like it! Looking over this past week we made 11 new recipes. The high points for me were the Chocolate Hawaiian Biscotti and Tomato Goat Cheese Strata. Even though we keep plugging away at the new recipe pile, I swear it just keeps getting bigger! At least there's a big selection each week to choose from. The recipe section on the left hand side has been updated with the past week's recipes. I did finally accomplish something that didn't have anything to do with the kitchen. 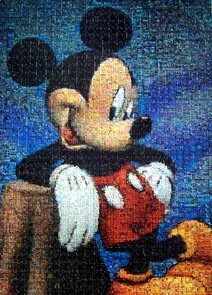 I've been working on a puzzle whenever I had spare time (which there seems to be little of these days) and finally finished it the other day. I like how it came out, but it was way more involved than I thought it would be when we bought it in Disney World. Netflix sent us the DVD of Wedding Date starring Debra Messing for tonight's movie. I've read some interesting reviews on this one, but the previews did look somewhat funny. I have the menu planned for this upcoming week and there seems to be a good variety of recipes. Check back with us and see how it works out! Biscotti has to be one of my favorite crunchy snacks. Perfect to dip in coffee or to enjoy alone, I'm always thinking about new ways to change up the flavor. I've never paired the combo we used today before, but Jeff has declared this to be his favorite combination. 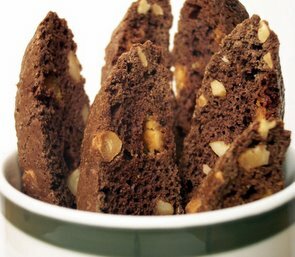 Chocolate Hawaiian Biscotti uses rich and buttery Macadamia nuts. We don't often buy these because they can be exceptionally expensive, but we love the crisp texture and bought some last weekend. I toasted them after chopping for just about 5 minutes in a 350 degree oven. I used two kinds of chocolate for this Biscotti - Dutch Process cocoa and white chocolate chips. Using this cocoa adds a deep rich flavor enhanced by a touch of espresso. For the white chocolate chunks I used a chunk of Callebaut that I cut up into smallish pieces. The biscotti is just crunchy enough, but they are not rock hard so they can be eaten easily. The DVD of the night from Netflix will be Moulin Rouge with Nicole Kidman and Ewan McGregor. I think i've seen bits and pieces of this on TNT but I've never seen the whole movie. I've been wanting to for awhile and it finally came up in the queue! Quiche, a savory pie usually filled with eggs, milk, and many different fillings, is usually baked in a pastry type shell. The one I made tonight for dinner has an interesting twist for the crust. 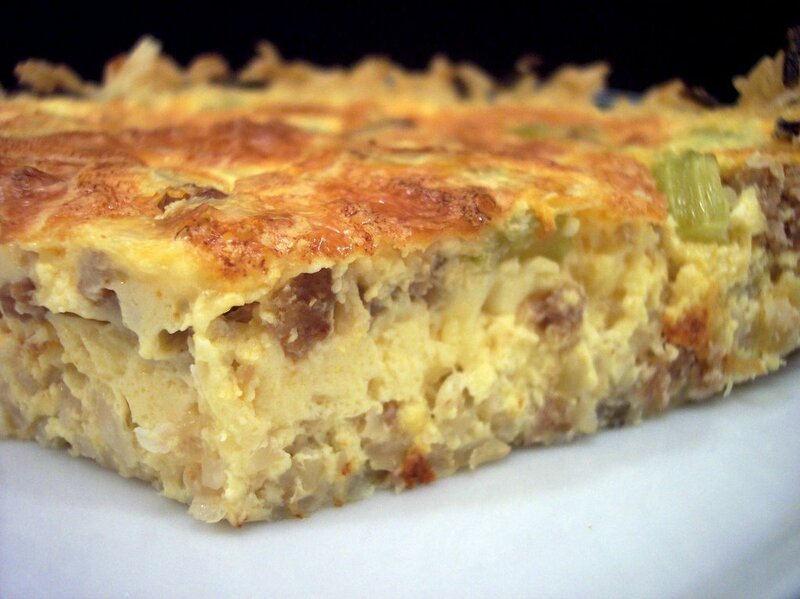 Cajun Quiche in a Rice Crust has a crisp, crunchy crust made from cooked rice. I used a brown and wild rice blend to give a bit more nutty flavor. Cooled rice is held together by mixing it with an egg, some seasonings and then easily pressed onto the bottom and up the sides of a pie dish. 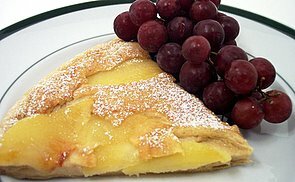 A bit of sharp cheese is placed on top of the crust before the filling is added. Veggies and smoky andouille sausage are briefly sautéed and then added on top of the cheese. Eggs, egg whites and sour cream form the base custard-like filling and is poured on to the sausage mixture. This is then baked until puffed and golden brown on top and the eggs firm up into a creamy and spicy pie. The crust holds together well and cuts cleanly. I'm always looking for new ways to use our supply of whole grains like rolled oats, wheat bran and whole wheat flour for healthy snacks. During our Trader Joe's stop on Sunday, I picked up some Golden raisins that looked very good so we had to get some. I was almost out of the Cran-Apple Muffins so I used the above ingredients to bake more muffins today to replenish the freezer. Whole Grain Raisin Muffins are packed with healthy, flavorful and filling ingredients. 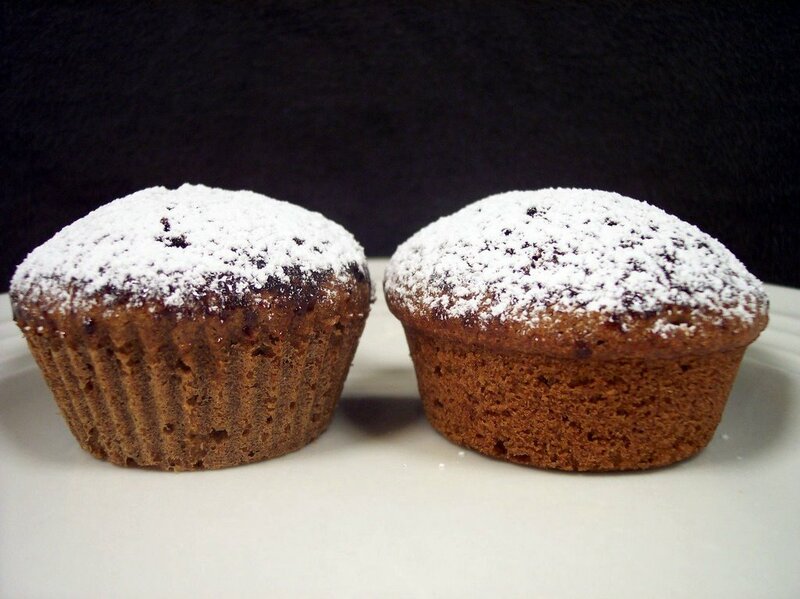 As expected from a bran-type muffin these have a dense texture, but are not heavy or hockey-puck dense. These muffins are moist, tender from the buttermilk, and have just enough sweetness. Using the plump golden raisins adds to the sweetness and lends a soft pleasant texture inside. Making these today also gave me a reason to test out a new baking item I also received over Christmas. I received 6 of these Sili-Cups , and after using them for the muffins I am so ordering more tonight. Unlike some other silicone baking pans I've used, these had no off smell while baking and they popped right out directly after removal from the oven. No more than a couple crumbs were left behind in the cups. 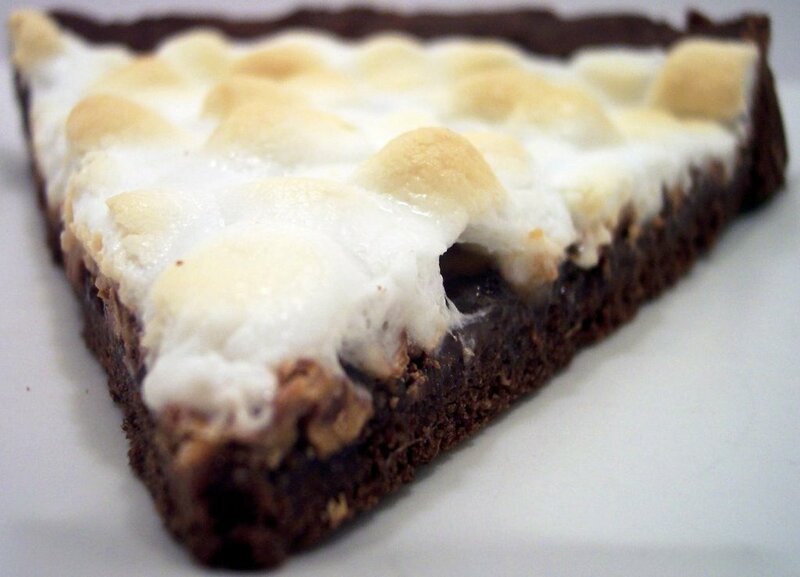 I can see filling up a big sheet pan with these and doing many muffins/cupcakes at one time. Too cool! Nothing too special tonight for dinner. 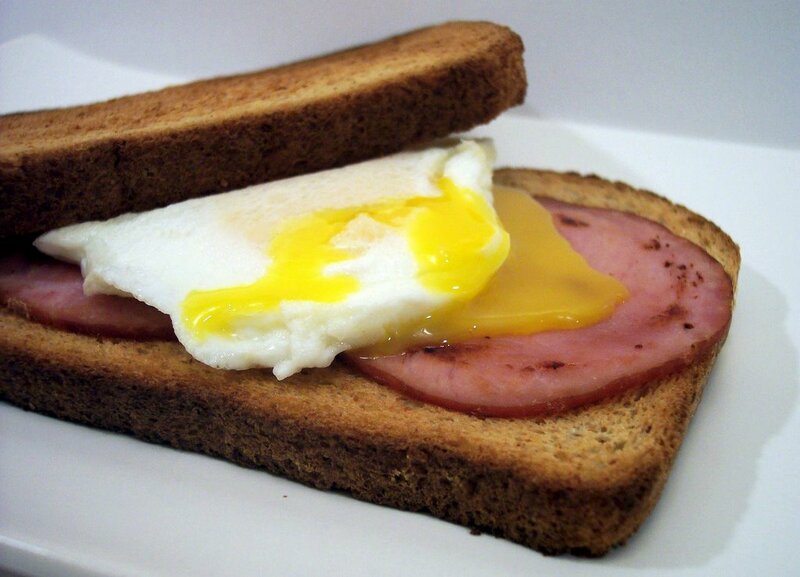 I was after a quick meal and we had some whole wheat bread to use up, so the dish tonight was Canadian Bacon and Egg Sandwiches. The recipe did have a caramelized onion topping, but alas I had no onions in the house as I used the last one the other night. Even without, these were quick and fantastic as we love Canadian bacon. 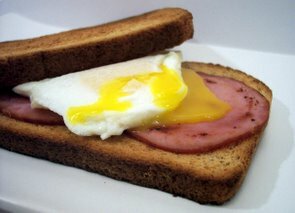 I gave the canadian bacon a few minutes in the pan to crisp up, but left the egg fairly runny as that's how we prefer it. Great quick weeknight sandwich! As I talked about earlier, I've been meaning to expand on making different types of bread. I was looking for something that was a little different and fun for today. Twisted Fennel and Coarse Salt Breadsticks has a unique crunchy coating of coarse salt and fennel seeds. In the dough itself, cornmeal is used to add a good contrast in texture to the soft sticks. I used a more coarse cornmeal rather than fine to bump up the crunch some. 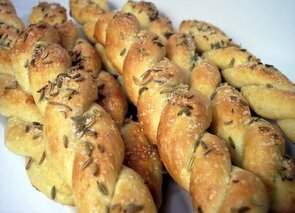 The dough is soft and is very workable so it keeps the design of the twists well. The fennel seeds add a delicate and subtle licorice-like flavor. These are so good plain, but I could see serving these with a dip or marinara to change it up. My mouth is still on fire from dinner tonight, but that is a good thing! Tonight we had Tex-Mex Chipotle Pitas and this is where I used the habanero and lime salsa. This came together so fast - from start to finish it was ready to eat in under 15 minutes. If you don't like things too spicy, I would use mild salsa instead. Even though we used a hotter salsa, I did decide to keep the jalapeño in the recipe as we really have started to like the flavor they give (that is something I thought I would never say!) The cumin adds a subtle musty/earthy flavor and if you can, use fresh ground cumin seeds as they have so much more flavor. 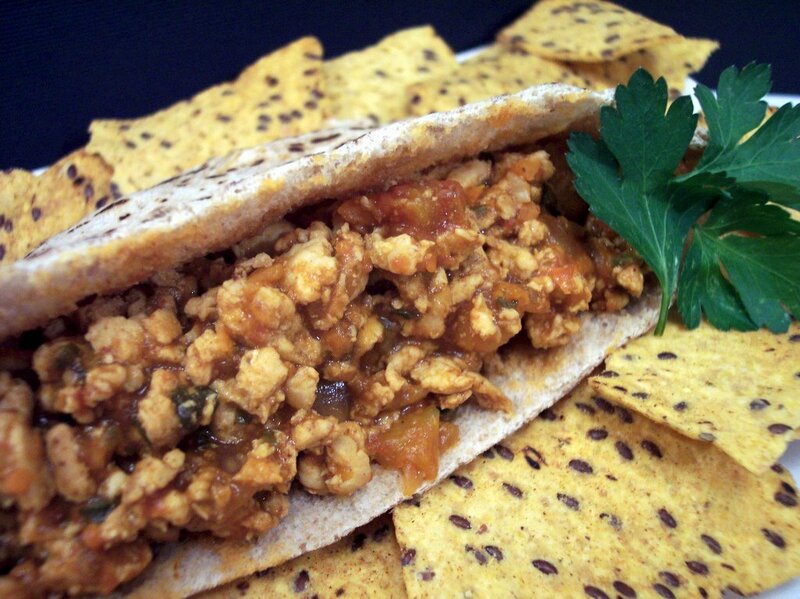 You could serve this in a roll, but I really love the texture of whole wheat pitas and this filled them up nicely. Busy day in the kitchen today as it is Tuesday, the day before Wednesday Treat Day at Jeff's office. I decided to make two recipes as there would be more people than normal there tomorrow and I needed an excuse to use a new display piece I got for Christmas. 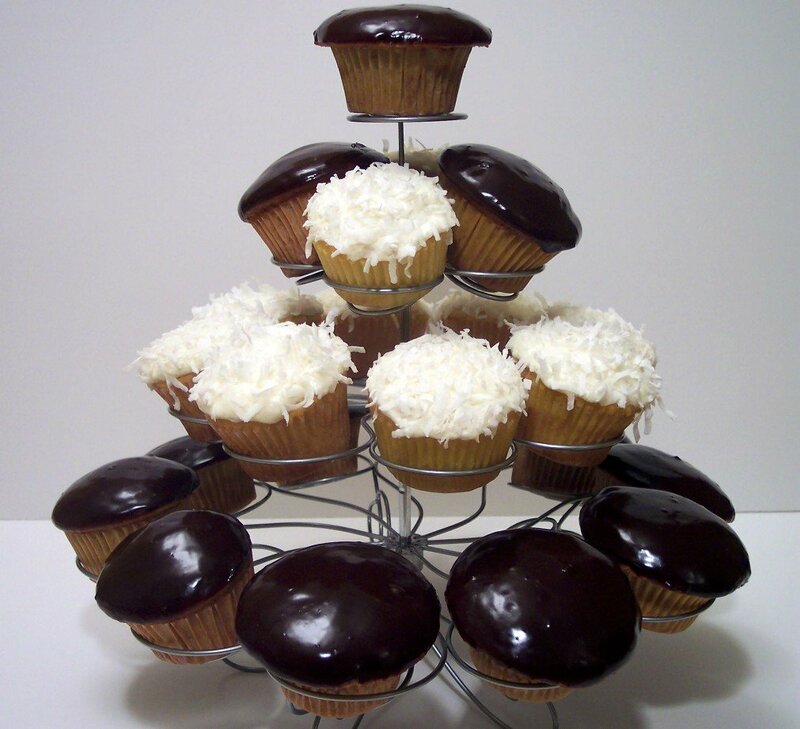 The first recipe, Coconut Cupcakes, uses coconut twice - once inside the cake and then on top of the icing. 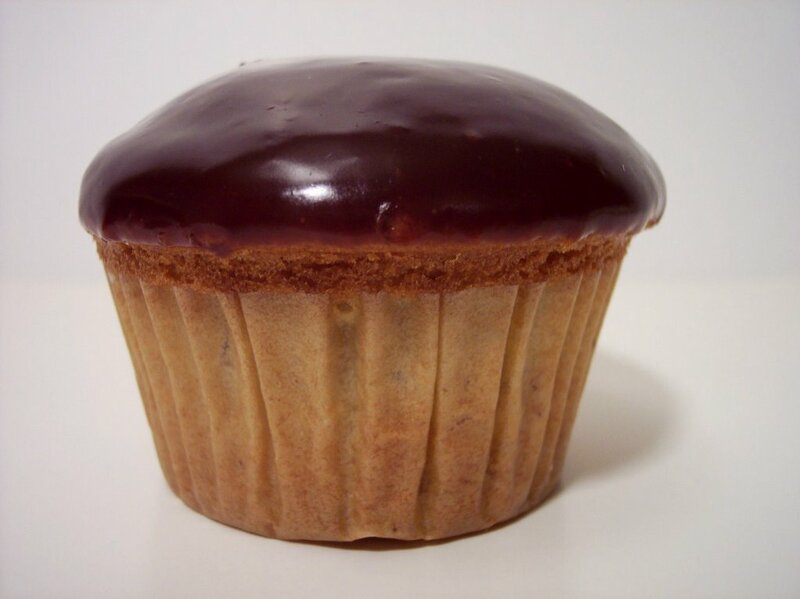 The cupcake itself crowns nicely and has a light texture, with a hint of almond. They are frosted with a soft cream cheese icing and then a showering of coconut covers the top. I was tempted to toast the coconut a little, but I decided I wanted to keep them clean and white. I love the flavor of toasted coconut though, so I might do that next time. 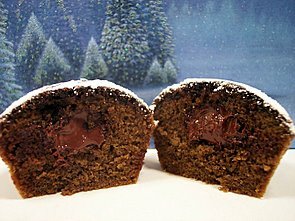 The second, Banana Buttermilk Cupcakes with Chocolate Glaze, has a batter similar to the above, but uses cake flour, no almond extract and of course has mashed bananas. I found that since I filled these a little fuller, the tops spread out and then crowned which allowed some of the sides to touch together. Next time I would reduce the amount in each cup to make 20 cupcakes, instead of 18, to fix that issue. They have a pleasant banana flavor and since the liquid is buttermilk, the cupcakes stay pretty tender. A simple chocolate glaze coats the tops evenly and sticks just enough so it does not drip down and is not heavy. I used bittersweet chocolate, but you could substitute with semisweet if needed. I loved the combination of flavors going on in tonight's dinner. Jerk Pork Tenderloin with Fresh Pineapple Chutney uses a quick (albeit not too authentic) jerk seasoning that includes spices most people would probably have in their cupboards. It does call for apple-pie spice, but since I did not have that I substituted 2 teaspoons cinnamon, 1 teaspoon freshly grated nutmeg and 1/2 teaspoon cardamom. I then took the needed measure amount from that and will save the rest in case I need it again! After searing the pork, it is baked until slightly pink in the center, so it stays very juicy. 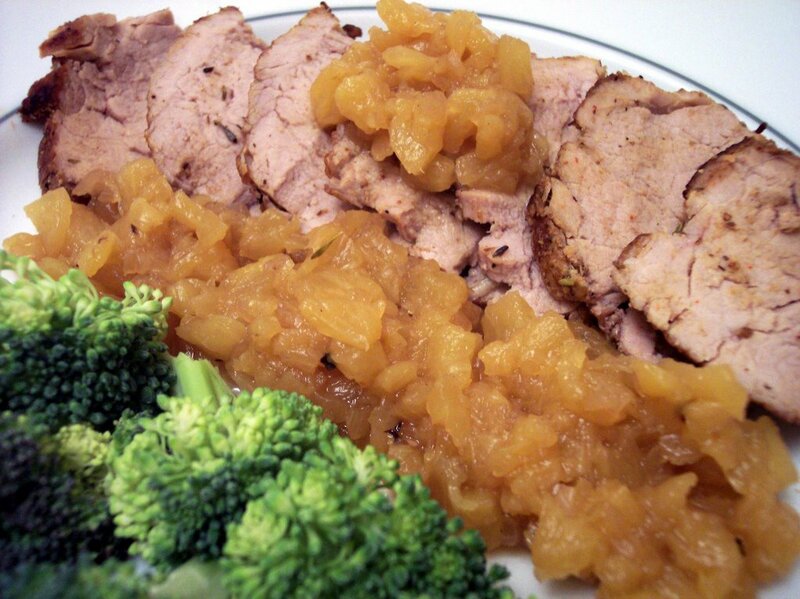 The fresh chutney adds a tropical sweetness and refreshing pair to the pork which is just a touch spicy. It was quick to throw together, and I'll get to have the rest of the fresh pineapple for a snack tomorrow! Can we call it a success?